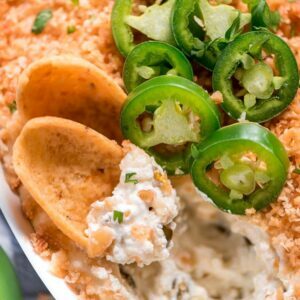 Jalapeño Popper Dip is packed with 4 kinds of cheese, just enough spicy Jalapeños to give it a kick, and a golden crispy topping. This dip is sure to be a hit at your next party! In a medium mixing bowl, beat cream cheese, yogurt, cheddar cheese, feta cheese, and jalapeños until well combined. Spread into a 1.5 quart shallow baking dish or small cast iron skillet. In a small bowl, mix together the crushed crackers, Parmesan cheese, and butter until it's all moist. Sprinkle over the top of the cheese mixture. Bake for 20-25 minutes until top is golden and dip begins to bubble. Let cool 5 minutes. Sprinkle with cilantro and serve with Fritos, crackers, or other chips.